When the conductors are used in transmission system for bulk power transfer, then they should fulfil following requirements. 1. They should have low weight. 2. They should have high tensile and fatigue strength. 3. They must have high conductivity. 4. They should have low co-efficient of expansion, low corona loss. 5. They should have less resistance and low cost. Thus base on conductivity, tensile strength, fatigue strength, corona loss, local conditions and cost, conductors are selected for a particular line. The conductors used in practice are made up from the materials such as copper, aluminium and their alloys. The advantages of using aluminium conductors over copper conductors are given below. 1. They have low cost. 2. Less resistance and corona loss. But aluminium has less tensile strength, high co-efficient of expansion and large area which restricts its use alone as a conductor. In order to increase the tensile strength of a conductor, one or more central conductors of different materials are used. These materials give high tensile strength. The different types of aluminium conductors used in power systems with full forms of their abbreviations are as given below. AAC : - All aluminium conductor. AAAC : - All aluminium alloy conductor. 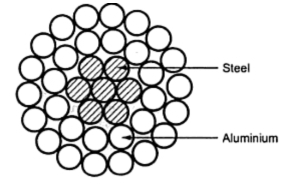 ACSR : - Aluminium conductor with steel reinforcment. ACAR : - Aluminium conductor with alloy reinforcement. Normally the conductors are stranded as it posses greater flexibility and mechanical strength as compared to single wires of same cross sectional area. In stranded conductors, a central wire is surrounded by successive layers of wires containing 6, 12, 18, 24 ... wires. The consecutive layers are spiralled in opposite directions so as to avoid unwinding. This also makes outer radius of one layer coincide with inner radius of the next. The stranded conductors are electrically in parallel and spiralled together. Due to use of stranded conductors the skin effect is reduced. Here d is diameter of each strand. 7 strand conductor will have one central strand with 6 outer strands each. The size of conductor is specified by its equivalent copper cross sectional area and the number of strands with the diameter of each strand. Now we will discuss in brief the commonly used conductors. The hard drawn copper conductors are used for overhead lines which provides high tensile strength. These conductors have relatively higher conductivity, long life and high scrap value. The copper conductors are used for distribution network where length of line is short and there are more tappings. The steel cored copper conductors are made by surrounding a steel core with on or more layers of copper strands. Due to addition of steel core tensile strength of conductor is increased. With addition of cadmium there is increase in the tensile strength of copper at the cost of decrease in the conductivity. Thus these conductors can be used for longer spans. As tensile strength is increased, longer spans with same sag is possible. The other advantages include easiness in jointing, more resistance to atmospheric corrosion, better resistance to wear and easy machinability. These conductors are carried by smaller supports and are subjected to low wind and ice loadings due to their smaller diameter. In this type of conductor, copper is welded on to a steel wire by hot rolling and cold drawing a billet of steel coated with copper. The uniform thickness of copper is welded. The conductivity of this conductor lies in the range of 30 to 60% of that of solid copper conductor having same diameter. These are used for longer spans such as river crossings. Due to increasing cost of copper, aluminium is used in transmission system. Electrolytically refined aluminium is rolled and drawn hard for use as condcutor. For a specific resistance, cross sectional area of aluminium condcutor is greater than that of copper while its weight is about 50% of that of copper conductor. This makes transportation and erection of such conductors economical. Corona effect is reduced due to increased diameter of conductor. These conductors are more used in distribution where transmission lines are short and voltage are lower. There are chances of inter phase faults due to swing if these conductors are employed in the areas where there are high winds. This is because aluminium conductors are lighter, with large conductor area and more sag. The mechanical strength that is obtained from conductor made up from all aluminium. This difficulty can be overcome by adding steel core to the conductor. The cross section of this conductor is as shown in the Fig. 1. As shown in the Fig. 1 there are 7 steel strands which forms central core. This is surrounded by two layers of around 30 aluminium strands. For a given resistance conductors of different strenghts can be made by taking different properties of steel and aluminium areas. The steel core does not contribute to conduction of current practically. The current carrying capacity and resistance of this conductor is dependent on conductivity of aluminium. The ACSR conductors are more commonly used as they have following advantages. 1. Due to high mechanical strength and tensile strength, the line span can be increased. The sag is small. So shorter supports are required for line. It is also possible to have longer spans for a given sag. Due to smaller supports, breakdown possibility is low. Insulators and other fittings needed are also less. 2. They have low corona loss. 3. Skin effect is less. 4. These conductors are inexpensive as compared to copper conductors having equal resistance without reduction is efficiency, useful life span and durability. The disadvantage with ACSR conductor is difficult to make splices and dead ends. There is possibility of corrosion due to electromechanical action between aluminium and steel core. The service conditions decide corrosion rate. This is higher in industrial and coastal areas. The compacted ACSR conductor or smooth body ACSR conductor is made by pressing conventional ACSR conductor through dies to flatten the aluminium strands into segmental shape. The spaces within the strands are filled while diameter of conductor is reduced. This does not affect electrical and mechanical properties of this conductor. Thus with same aluminium area, diameter of steel core is increased which increases mechanical strength. These conductors can be used for larger span lengths. This is shown in the Fig. 2. The expanded conductors are made by adding a plastic or fibrous material between steel core and aluminium strands. This increases diameter of conductor which reduces corona loss and radio interference at extra high voltages. This type of conductor is shown in the Fig. 3. The filler material such as paper separates the inner steel strands from outer aluminium strands. The conductor made from aluminium alloys are suitable in urban areas as they provide better tensile strength and condcutivity. These alloys are known with different names in various countries. Some f these alloys are costly as they are heat treated. One of the alloys of aluminium is known as silmalec which contains 0.5% od silicon, 0.5 % of magnesium and rest of aluminium. Due to this there is improvement in conductivity and mechanical strength. In such conductor, the central core is made up from aluminium alloy which is surrounded by layers of aluminium conductors. The conductivity is better and strength to weight ratio is equal to ACSR conductor having same diameter. As compared to ACSR conductor, ACSR conductor is smaller in size and lower in weight for the same electrical capacity. This type of conductor is strong than copper conductor and may be used for longer line spans. The conductivity of such conductor is low which can be improved by use of cadmium-copper core. Phosphor bronze is found to be suitable for atmospheres containing harmful gases. In this type of conductor, aluminium is welded on a high strength steel wire. This is costlier as compared to steel cored aluminium (SCA) or ACSR conductor. Around 75% conductor area is covered by aluminium. This is used in earth wires. This type of conductor is suitable for large length line span or in rural areas where load requirement is comparatively smaller. This type of conductor has high strength. The conductor has large resistance, inductance and voltage drop. The disadvantage with this conductor is it has shorter life. premium quality Aluminum Conductors, a.a.a.c conductors, Air Break Switch and Fuse and Power Insulators.